UPDATE: By a margin of 4 to 1, the ERI is being recommended to stay in the codes, basement’s only need the top 4′ & the 62.2.10 spec still stands. This purpose of this meeting is to discuss revisions to basement wall insulation which includes Tables R402.1.2 and R402.1.4 in addition to Section R402.2.9, Section R406 Energy Rating Index Compliance Alternative and Sections under R403.6 Mechanical Ventilation (mandatory). 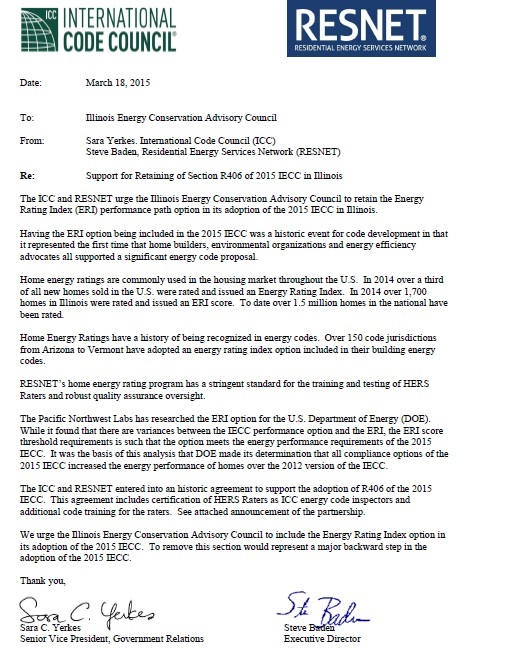 If there are any other organizations or individuals other than HBAI, RESNET (Steve Baden) and International Energy Conservation Consultants LLC (Darren Meyers) that would like to provide comment on any of these issues, please notify me at least 24 hours prior to the meeting and you will be added to the agenda. A maximum of 5 minutes will be allowed for an organization or individual to speak on any one topic unless more time is allowed by the Chair. Depending on the number of requests, the time may be limited to 3 minutes. Otherwise, participation from the public members will be allowed at the discretion of the Chair and subcommittee members. As you may recall from our last piece, numerous items passed which includes Illinois keeping the allowable air leakage at 5 ACH, some administrative language & the elimination of the sealed mechanical room. The three items still up for debate is the HBAI & there fight against changing the current 4′ requirement for basement insulation (Darren’s pushing for 2009 standard full depth at R10 / 13). The second is the ERI which RESNET & hopefully the HBAI will be fighting for against IECC & some bad perceptions (to difficult to understand, requires much more training…). The final one is are we going to adopt 62.2.13 which initially passed but was brought back for reconsideration. Last year over a third of new homes sold in the U.S. were energy rated and issued a HERS Index Score. 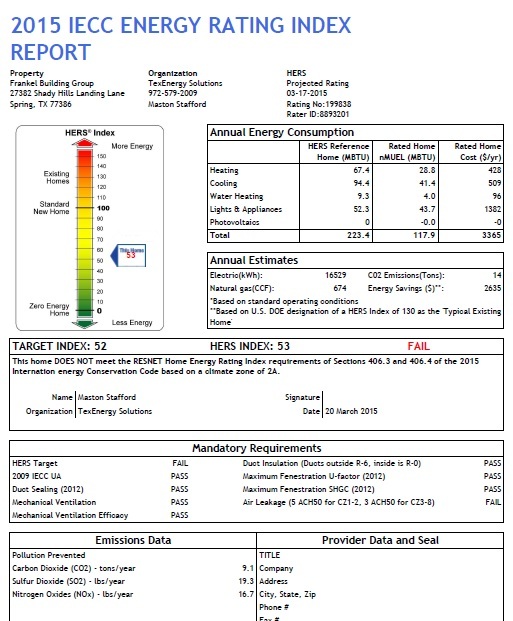 To date over 1.5 million homes in the U.S. have been energy rated using RESNET’s standards. One objection raised is that this would be hard for code officials to understand and to ensure compliance. With that Steve sent a copy of the 2015 IECC ERI compliance report. This one was generated for a house in Texas which has a lower ERI number requirement than Illinois (52 vrs 55/54). As you can easily see this house fails the target HERS rating & also the required ACH target. As for all the other required IECC mandatory requirements it easily passes. Compared to many other items code inspectors have to be able to understand, this one looks like child’s play. 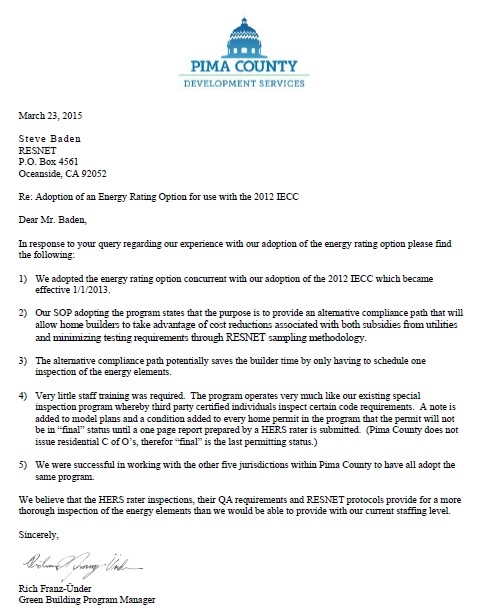 To further show that the ERI option is pretty easy to implement, the following letter was also submitted from Pima County Arizona which has been using this option since 2013. For those that don’t know, Pima County is the second most populous county in Arizona which covers over 9100 square miles with Tucson being the county seat. I got to say the last line nails it especially with how short-handed &/or overworked many AHJ’s are now. In closing, next Monday will definitely be interesting to see how this finally shakes out. Hopefully the bad perceptions that some have pushed to get this blocked will be disproven, but hey this is the land of vote early & vote often. After this meeting is held, it will got to the full committee which is unlikely to overturn any recommendations and then it goes to the Capital Development Board for final approval. If you are a builder, rater, or code official that would like to weigh in, please see the RESNET call to action section above. If you would like to add your name to the online petition to keep it – click here.